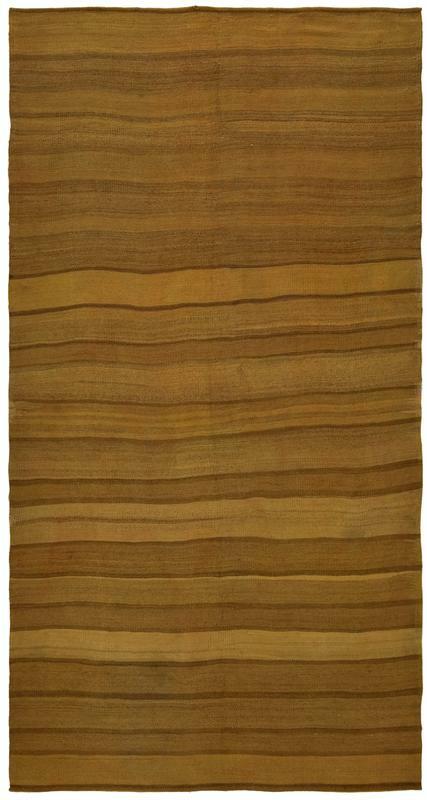 4' 9" x 9' 1"
A succession of bands and stripes in various shades of tan and ochre gold unfolds with an almost biomorphic rhythm on this arresting Bidjar kilim. In the lower two thirds, the various bands are underscored by somewhat darker intervening stripes. In the upper area the contrasts are more subtle, producing the effect of a gentle rippling variegation. A closer look reveals that such subtle shading plays out across the entire surface, even within the more sharply articulated bands. The design is alive in its constant shifting or transformation. The richness of the soft earthen coloration is best appreciated in person.